1761 (October) The 109th Regiment (Battalion of London Volunteers) was raised in the counties of Hertfordshire and Middlesex, England with Major Commandant John Nairne as C.O. Establishment from December 1761 was 280 men in four companies. The Regiment was stationed at Harrow, Middlesex, then Royston and Wisbech until being sent to Aylesbury in Buckinghamshire during March 1762. In 1762 'Pountenay's Independent Company' was added as a fifth company to the Regiment to be followed by the 'Independent Company of London Volunteers, although in the strictest sense this company never served with the 109th as it was used exclusively to guard French prisoners captured during the Seven Years War, at a camp in Bristol. In May 1762 the 109th moved to Belleisle, recently captured from France, where it remained in garrison until the end of the War. Returning home to Bristol the 109th was stood down on the 10th June 1763 and the Regiment Colours were presented by John Nairne, who was the son of the third Baron Nairne (Scotland), to the Duke of Atholl to be preserved at Blair Castle, Scotland. 1794 (April) The second time 109 was assigned to a regiment that was raised in Aberdeenshire, Scotland. Colonel Alexander Hay of Rannes, a former officer of the 104th Foot, persuaded the King to grant him permission to raise his own regiment. Colonel Alexander Hay of Rannes used an ingenious method of recruiting men by paying each volunteer a bounty of Five Pounds then further authorising a raffle amongst every twenty recruits whereby the winner would receive 100 pounds and permission to buy his discharge for twenty pounds, thus providing the winner with an eighty pound profit plus the original 5 pound bounty. By the 4th September 1794 the 109th Regiment comprised twenty-three officers plus seven hundred and eighteen enlisted NCOs and men. Posterity does not record how many men took advantage of the twenty pound discharge fee! The Regiment, having formed marched to Dundee at the end of September thence via Burntisland, Fife to Southampton, England in late October. Upon arriving in Southampton the 109th embarked for the Channel Island Jersey for eight months and in 1795 joined General Abercrombie's force bound fore the West Indies. Before the move could be completed Colonel Hay received notification that his regiment was to be disbanded and amalgamated with the 53rd Regiment. As was traditional at that time (and still is with similar circumstance of the British Army) there was much complaint and politicking, however whatever the circumstance of the infighting amongst Aberdeenshire gentry, Mr. Allardyce of Dunottar (Aberdeenshire) in the House of Commons declared that Aberdeenshire had no complaint with the amalgamation and this seemed to win the day over the support for the 109th by General Macleod. On the 12th September 1795 eighteen officers together with the muster of the 109th transferred to the 53rd Regiment ending the 109th Aberdeenshire Regiment of Foot. 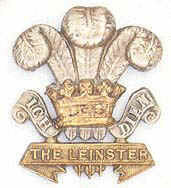 The last regiment to inherit the number 109 was the regiment that eventually became the 2nd Battalion of The Leinster Regiment, but before inheriting the number 109 it existed as something else, the 3rd Bombay European Regiment, a regiment with a gallant and distinguished service record.